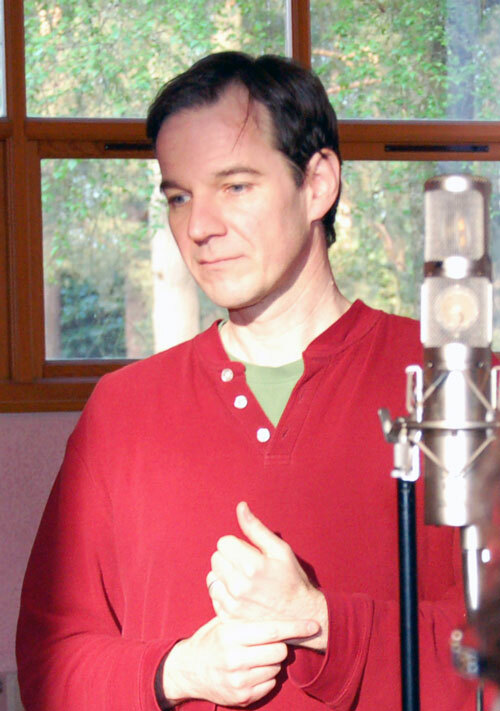 Fabian Lochner is musical director of Voices of the Forest. "Inspirational", "amazing" and "exceptional" are just some of the words that Voices of the Forest choir members use to describe Fabian. Choir members would be the first to agree that Fabian, who teaches music and drama at the Sheiling School in Ringwood, is a hard task master, and that he expects a great deal of effort and commitment from his singers. But the results speak for themselves. Fabian's professionalism, drive and high standards – and his refusal to accept second best – help us to produce some beautiful sounds and to strive for continuous improvement in our singing. Fabian's professional background is both eclectic and highly accomplished. Born and raised in Luxembourg, speaking both German and French, he discovered a love of music early on. He studied piano and organ at the age of 12 and as a teenager became the organist at an English church in Luxembourg. He then moved to Belgium, where he studied at the Conservatoire Royal de Musique in Brussels with an inspirational teacher, Walter Meessen, who introduced him to singing. "Most things I know about the voice, I learned from him, or developed further from the foundation he gave me." Fabian then moved to the University of Notre Dame in Indiana, USA, where he taught and researched for five years before moving to New York to study Eurythmy. Eurythmy, devised by Rudolf Steiner, is a structured form of movement to accompany music or the spoken word. "Eurythmy is a form of movement that is gentle and powerful, that uses the resources of the body and puts them in touch with the spaces around us. It transformed the way I think about teaching and about the body as a vehicle for expression, and it affects singing too. It influences everything I do to try to unlock potential and to bring out the best in people." Following this experience, Fabian worked at a Camphill Steiner school in Pennsylvania on an educational programme for young adults with special educational needs and then as director of music at the Sunbridge College in New York, a Steiner Teacher Education Centre. All these experiences inform Fabian's current role as part-time music and drama teacher at the Sheiling School and College in Ringwood, which caters for people with many different types of special needs. The turning points and experiences in Fabian's life have also had a profound influence on the work he does with the choir and with his voice studio, where he gives individual lessons to people who want to develop their voices and become confident in their own singing. Fabian has a firm belief that people are capable of far more than they think! "Sometimes people have had disappointing experiences in the past, but they can often move forward to a point where they discover that they have worthwhile, beautiful voices and that they can sing with strength and power. I very much enjoy working with people in this way and would like to do more of it." In addition to interest in the choir, Fabian welcomes enquiries from prospective voice or piano students or from community or other groups interested in exploring the use of the voice as an uplifting and rewarding shared experience. Fabian has also founded a plainchant choir called Schola Nova Silvana.